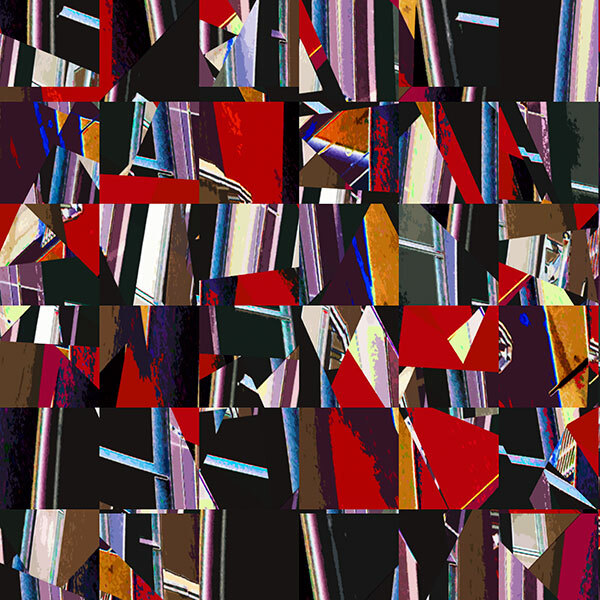 This is the third set of 'abstract' images evolved from traditional photographs and assembled circa 2007, with content and text revisions made in 2015. The ABSTRACT IMAGES BASED ON ARCHITECTURE gallery has notes on the development of 'these 'abstracts'. A curving façade of flat glass panels was added to the original auditorium structure of 1928 as part of the 1994 renovation and extension of Edinburgh's Festival Theatre designed by the architects Law & Dunbar-Naismith. 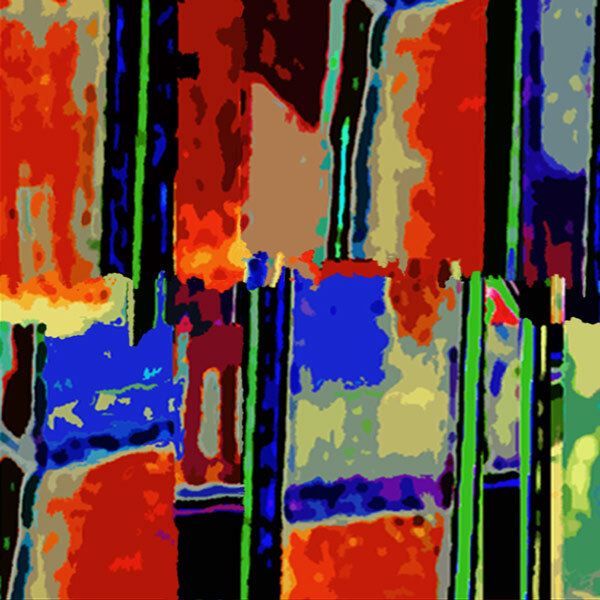 This abstraction is based on a photograph of multiple streetscape reflections carried by the new glazing. Lake Point Tower is close to the Lake Michigan waterfront in Chicago and images of it appear in the 'Chicago Architecture' galleries. With 900 apartments on 70 floors reaching 645 feet, the curving facades carry a dense window pattern. 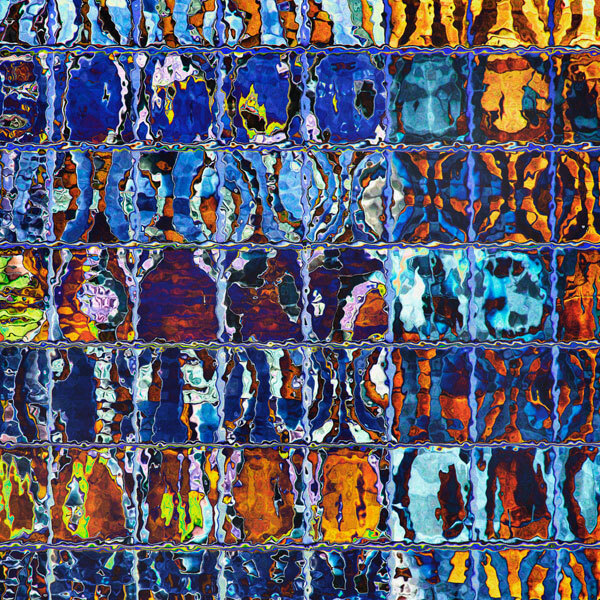 This image is a combination of several individual photographs of a small area of that glazing. The colours are pure invention and the layering sought to create an interwoven network of grid lines. 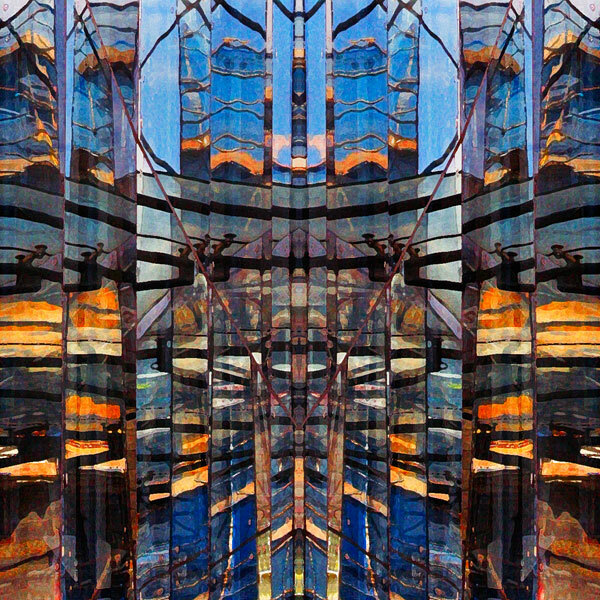 A single tower block façade in Vancouver carried reflections of several others and provided the starting point for a series of abstractions of which this is one. The REFLECTIONS IN ARCHITECTURE gallery contains a set of original photographs. Hindsight inevitably tells me that I should have spent more time hunting reflections in the glass architecture of Vancouver (and Chicago), than I actually did. Images recording the reflection of a building can often be more interesting visually that a direct view of the building itself. This is from a small series of images progressed from photographs of reflections of the Scottish Parliament and other structures in the glass screen fronting the Dynamic Earth building in Edinburgh. Designed by Michael Hopkins and completed in 1999 it shelters under a tensioned fabric roof. It was originally to be translated into a LARGE line drawing on paper from which all the enclosed shapes would be cut, painted and reassembled to form a hard edge abstract colour composition. On one of several waterfront photography walks between Newcastle and South Shields I photographed an outdoor machine structure at an undersea cable factory. Part of it incorporated a drum of wound cable of which this is a detail. 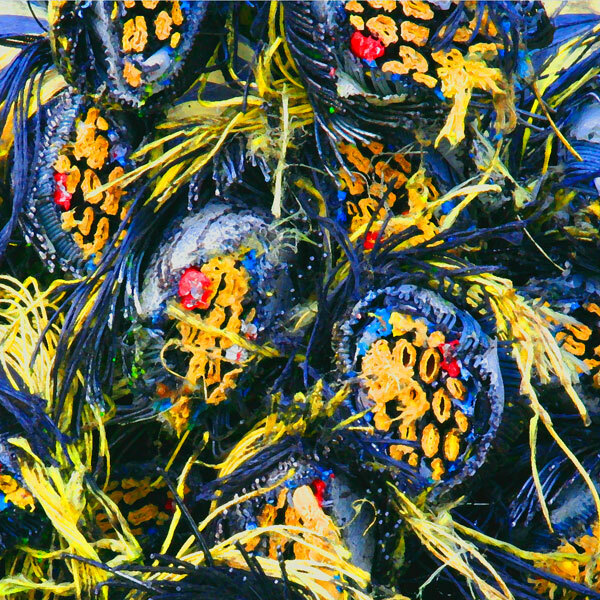 This image is quite close to the original photograph from which I wanted to create a two-dimensional painterly image. Two views of sections from the structure itself are contained in the STRUCTURES 3 gallery. On a later walk and at the same point as in the previous image I recorded this detail from a stack of roughly chopped undersea cable. The original photographs hinted at organic sea forms and it was with that in mind that I worked towards this final image. 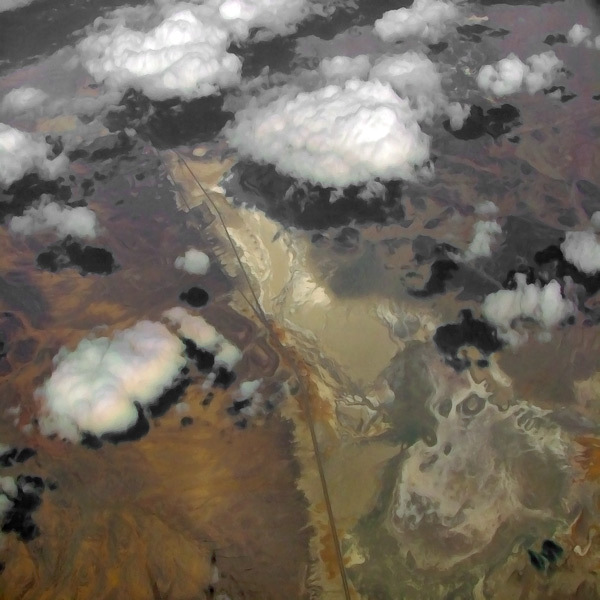 This and the following four compositions are based on aerial photographs of Nevada and Oregon made in the autumn of 2005 using an early digital camera with a fixed long zoom lens. 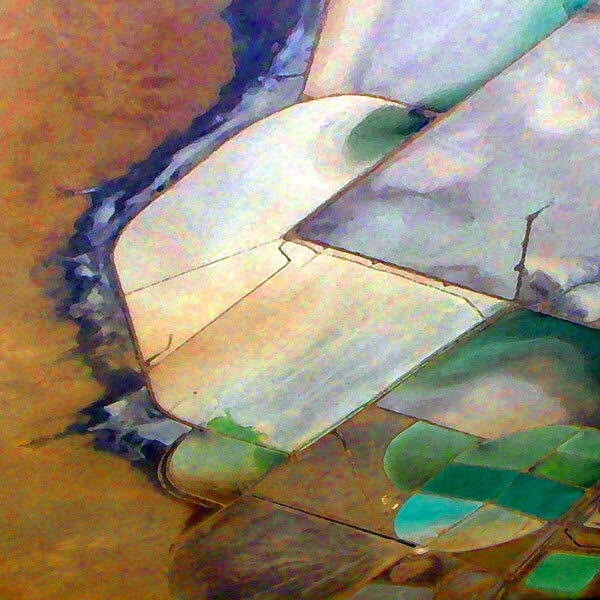 I had already studied satellite resource survey images and was intrigued by the effect of colour coding used to define different topographical categories such as crops and irrigation. This stylised image describes a Nevada desert landscape traversed by a lone highway but the colours are simply a personal preference. Watercourses thread this wild landscape over which some boundary markers have a tenuous hold. Corner and MacLean's 'Taking Measures Across the American Landscape' describes the history and rationale underlying the mapping grid underlying the American topography. So clearly echoed on cultivated open prairie and urban street plans, the gridlines in this wild terrain are but a suggestion. My very different intention was related more to seeking inspiration for abstract acrylic paintings that might emerge from a few hours of flying time. Working towards digital prints soon became more appropriate as there seemed to be little creativity in reinventing in paint from a photographic base. 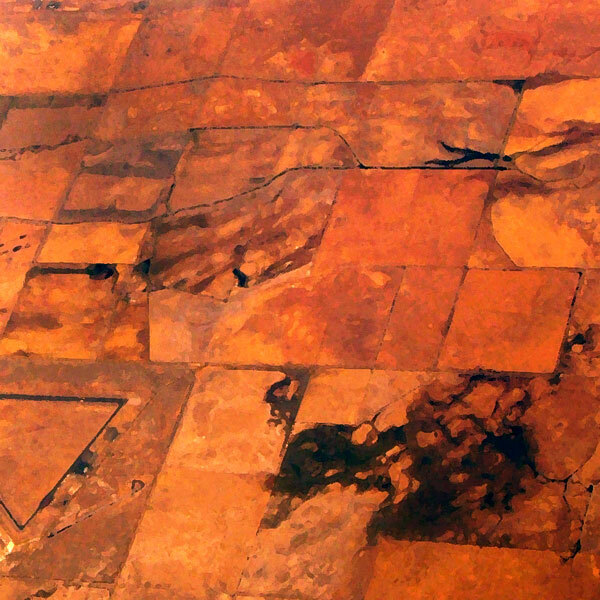 In this image, farmland created by water from underground aquifers meets the arid landscape of the native desert. This relatively dry landscape carried clear markings of the mapping grid used nationally. The triangular enclosure was difficult to see until the image was developed. 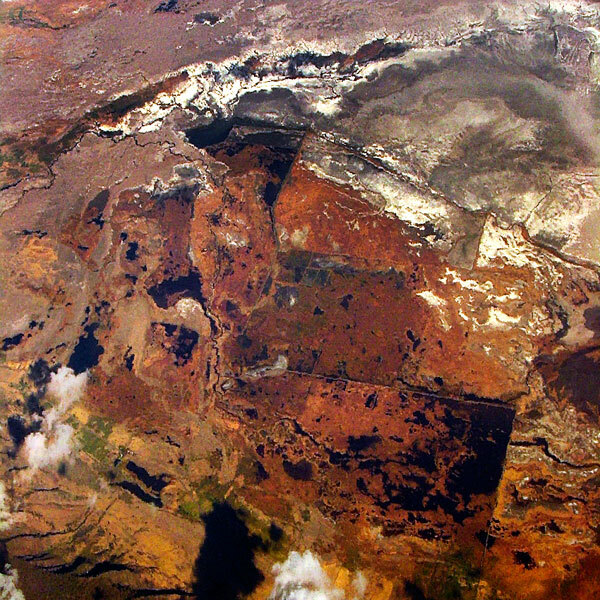 The colour profiles of some satellite survey photography influenced these images but without following their scientific purpose. The original images were neither clear nor well-lit but were enough to prompt experiments. Real aerial photographers have an incredible canvas spread out below as a visual feast. 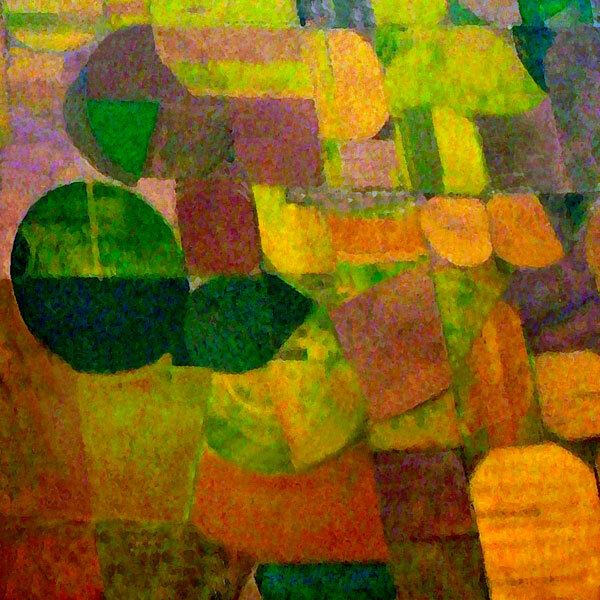 The colours of this deliberately 'painterly' image are far removed from the camera record of field patterns created by desert irrigation. 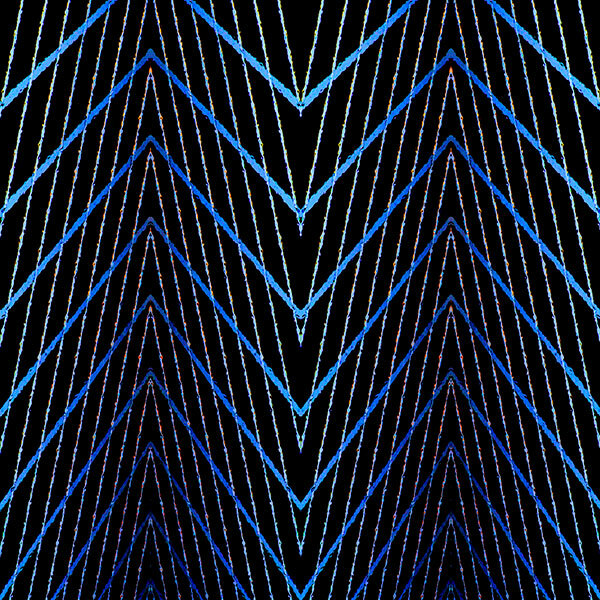 It was the outcome of a series of computer cruises concentrating on shape and colour texture with the basic composition derived from the photograph. 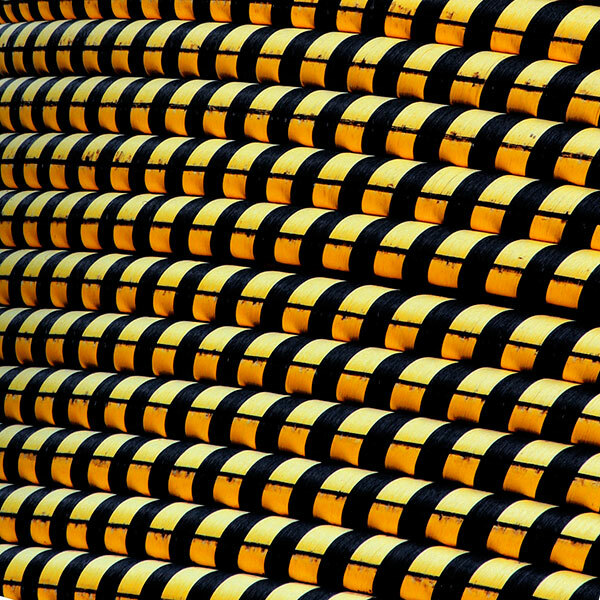 This abstraction began as one of a series of 2004 photographs made during the assembly of the Sage Gateshead's rounded and undulating roof. The first were made using a film camera whilst others, including this, came from my first digital camera. The ROOFING THE SAGE gallery holds a selection of monochrome images. 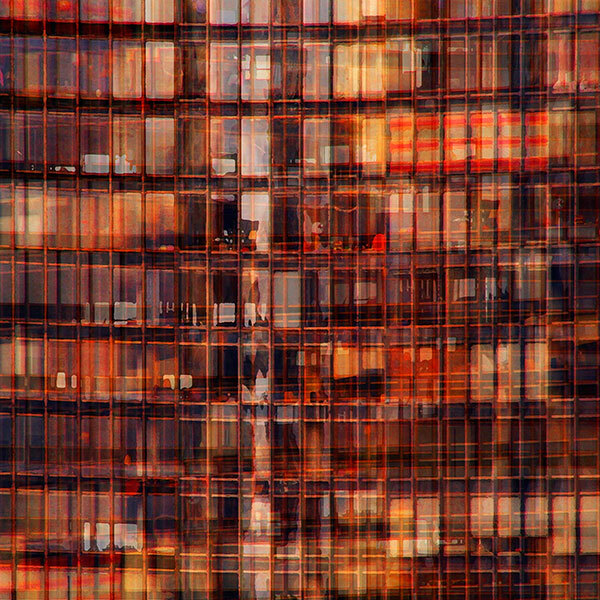 'Chicago Glass' was derived from one of the first digital photographs I took of buildings in Chicago some years ago. The Thompson Center of 1985 by Murphy/Jahn incorporates a vast and intricately detailed atrium within its unusual external form. The then freedom to photograph inside no longer applies. 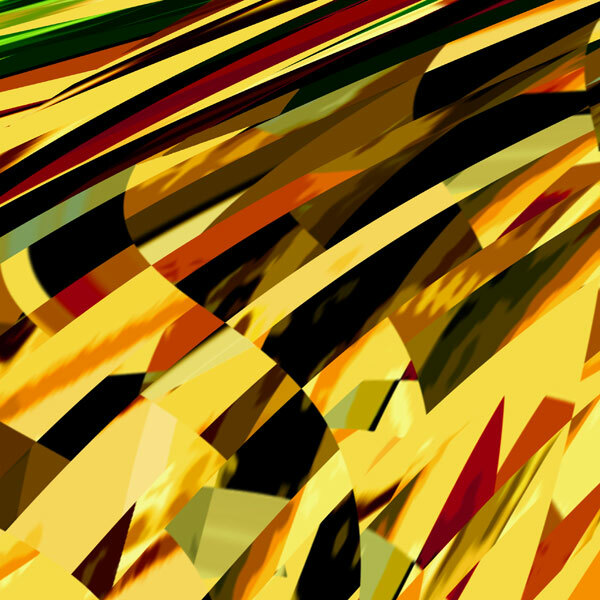 I cannot recall how this abstraction evolved from the original straight photograph. 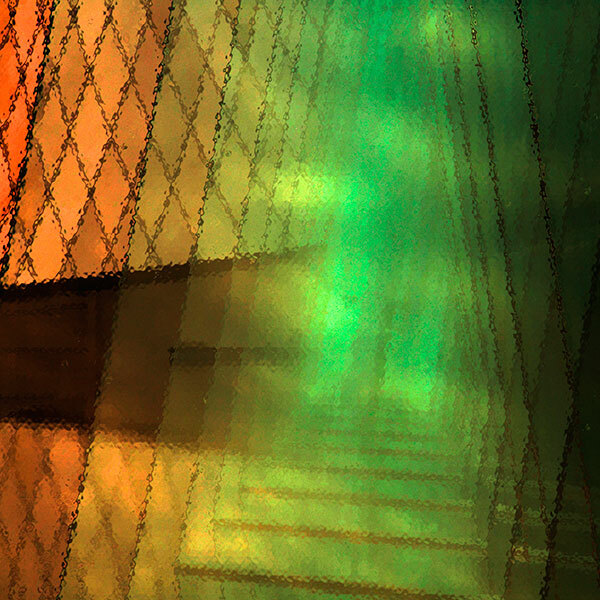 A linear composition derived from a photograph of Seattle Central Library. This austere composition Must be one of the few in this set where the term 'non-representational abstract' might apply. 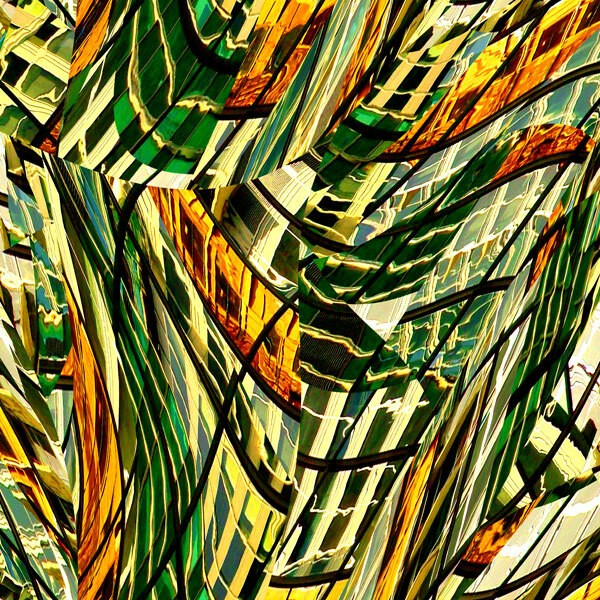 The ABSTRACT IMAGES BASED ON ARCHITECTURE contains a further six abstractions evolved from Seattle Central Library photographs. Berwick Lighthouse stands at the end of a long stone pier on the north shore of the River Tweed estuary. 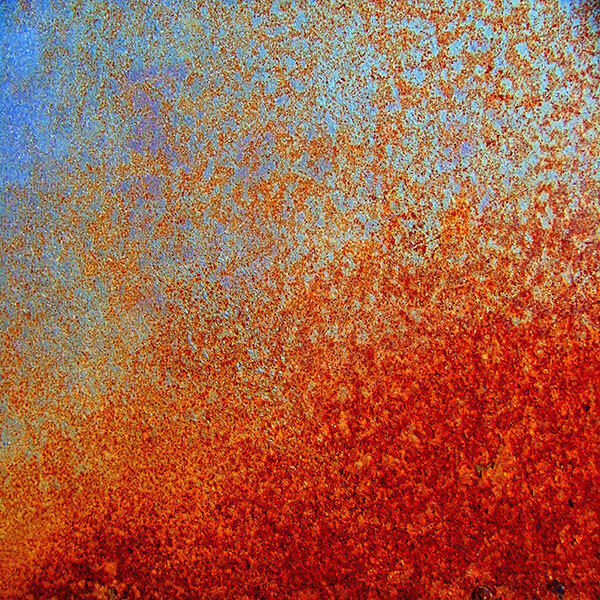 Vivid red rust was spreading upwards on the grey zinc galvanised steel panel covering its entrance door. 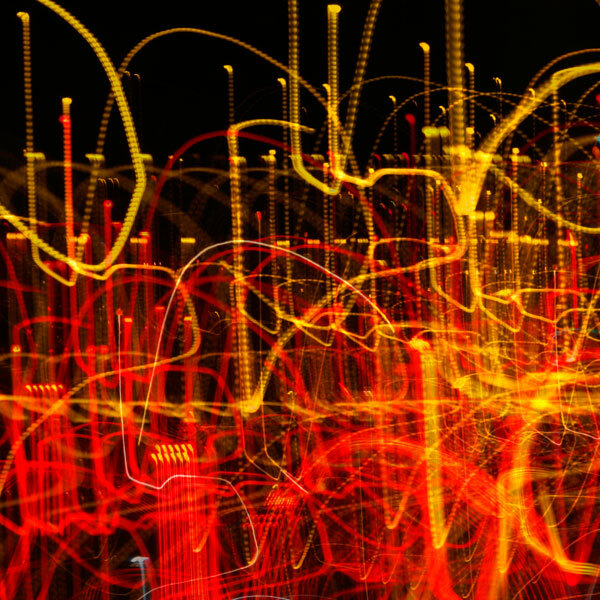 Two simple intentional camera movement images of city lights and moving traffic are layered in this 'double exposure' image.